LMR 240 series (RG 8X equivalent). 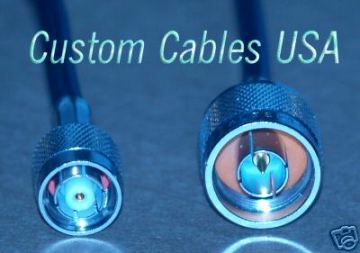 We make custom RF/Radio/Microwave/WLAN cables! FAST, Easy to work with, and LOWEST market Prices! 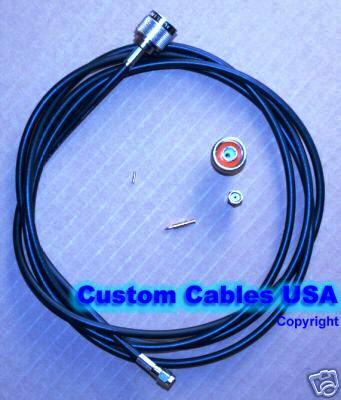 LMR 240-series Cable Assembly We make Custom Wi-Fi/RF Coax Cables / Pigtails /Jumpers for your special needs! For cables over 12 ft, may we suggest that you use the ultra-low-loss LMR400 to help limit the amount of WiFi signal loss (i.e. obtain more signal strength), if that would be an important factor for your application. For cables over 20 ft, *may we suggest that you use the ultra-low-loss LMR-400 to help limit the amount of WiFi signal loss (i.e. to obtain more signal strength), if that would be important for your application. For cables over 20 feet - *may we suggest that you use the ultra-low-loss LMR400, LMR400uf, or LMR600 to help limit the amount of WiFi signal loss (i.e. to obtain more signal strength), if that would be important for your application. Connectors ONLY *All LMR240 series are LMR240 equivalent, and 400-series are LMR400 equivalent. No cables included. Current available connectors are mostly 3-piece-Crimp or Solder type only - See Pictures; Contact Us if you need other types. Volume Discounts available. See Pictures; Contact Us if you need other types.